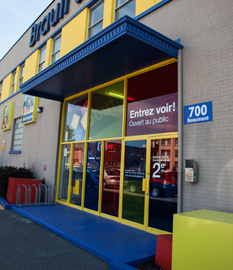 Since 1944, Brault & Bouthillier has contributed to the learning and global development of children by providing a fun and educational collection of quality products and by offering training and consulting services to educators and parents who wish to see children achieve their full potential. Our experienced team of specialists and representatives and our customer service team attend to the entire country with sales offices in Quebec, Ontario and the Maritimes. An exceptional range of products, carefully selected and tested by our specialists, to ensure that they meet all aspects of quality, safety and relevance to the different educational programs in Canada. A team of specialists, experienced sales representatives and a customer service team that serve the entire country with sales offices in Quebec, Ontario and the Maritimes. One boutique with more than 8,000 square feet located on Beaumont Avenue, in Montreal. 100 employees who are all committed to offering you the best service possible. 150 personalized training sessions offered each year to early childhood educators, teachers and other education professionals. 10,000 products, carefully selected from around the world and tested by our specialists to ensure they meet our high safety and quality standards. Offering customized training for professionals in education or the general public, which is available equally in and outside of our shop located on Beaumont Avenue. Training body accredited by the Commission des partenaires du marché du travail under the Act to promote workforce skills development and recognition. Training sessions designed to introduce new products (toys, games, arts & crafts material) and suggest their use in school settings. A wide range of robotic training sessions: from introduction to new users to specialized training and support for teachers and the general public. Arts & crafts workshops designed for hands-on experience on a variety of new products and techniques. For education professionals and the general public. BB Education, together to learn, create, play! 1944 Foundation Seed money: $800 and a good measure of determination. 1953 BB School Supplies expands its activity in Eastern Canada. 1960 Advent of the public kindergarten class. BB plays a leadership role and grows significantly. 1964 The first catalogue is published. 1966 The Brault family acquires all shares in the company. 1967 The Visual Arts are taught in schools for the first time: B & B is at the forefront of the phenomenon and expands again. 1974 Acquisition of the current building on Beaumont Avenue. 1981 BB becomes a truly pan-Canadian company and sets up shop in the Toronto region. 1988 BB modernizes its entire infrastructure in order to ensure a quality service worthy of its role as an industry leader. 1991 The company acquires Jocus and enters the mainstream market. 1993 A boutique and a Jocus training centre open in Mississauga, on the outskirts of Toronto. 1997 Kindergarten classes become full time and childcare centres make their appearance. BB plays a leadership role and goes into high-growth mode. 1999 BB prints its first Early Years catalogue. A sales team is created. 2001 BB is present on the Internet. 2012 Major investments are made involving all aspects of BB. 2013 The company’s brand image is modernized. BB School Supplies becomes BB education. A new transactional Web site goes online: BBeducation.ca.